✔ YOU’RE LONGING TO FEEL MORE JOY AND PURPOSE IN YOUR LIFE. YOU’RE THINKING, SURELY WIPING STICKY TODDLER HANDS AND PICKING TOYS UP OFF OF THE FLOOR CAN’T BE ALL THAT THERE IS! The lies and misconceptions you may be believing about yourself, about God, and about your relationship with God, as well as the truths that can transform your life and enable you to walk in full confidence and freedom! I know how frustrating it can be to try to have that routined quiet time in a house that’s far from quiet. 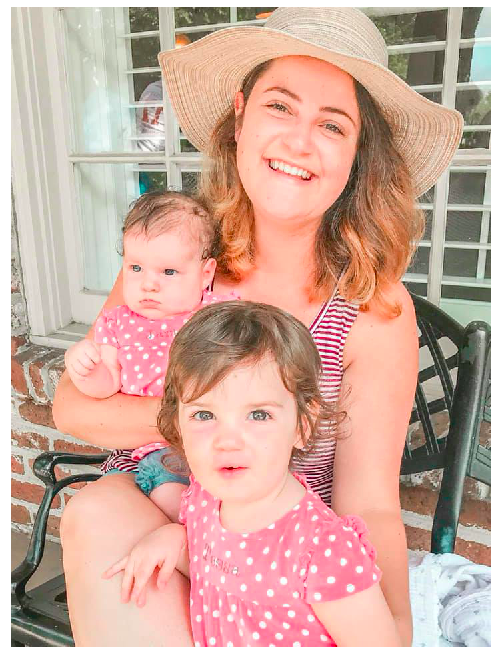 I know how tempting it is to get caught up in day to day #realmomlife distractions, whether that’s chasing down a spaghetti-sauce-wearing toddler, caring for a sweet, hungry babe, or getting the kids to soccer practice. And I know it’s discouraging when it seems like no matter how hard you try, you just can’t figure out how to connect to God. I know all of these things from personal experience. But what I also know is that it is possible to connect to God even in this season of motherhood. In fact, the things that make us feel robbed of that connection can actually be the things that help us grow that connection. And it’s through this course that I can show you how. 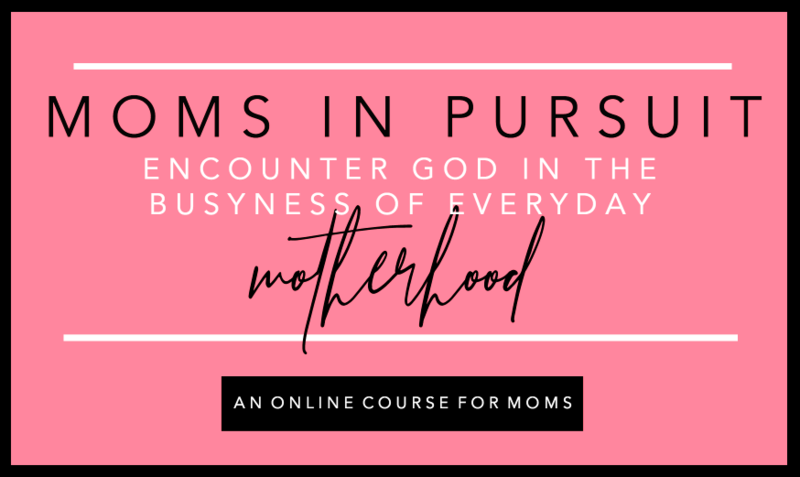 I created Moms in Pursuit because I want moms to experience and encounter more of God’s presence in their everyday motherhood. 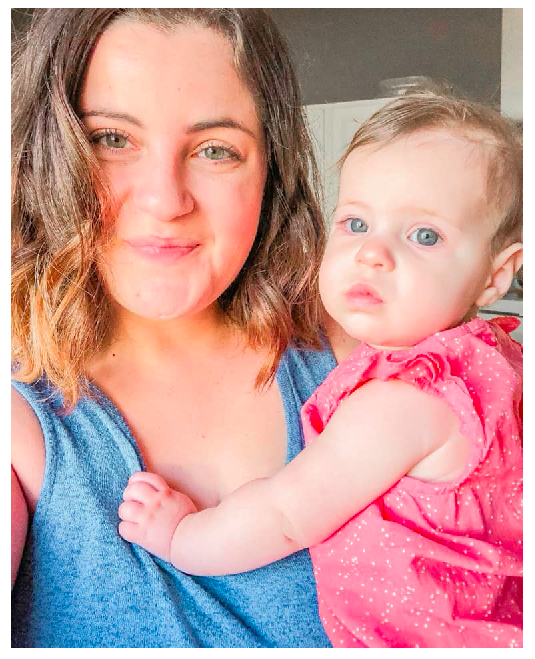 I’m tired of seeing the enemy win at convincing women like you and I that motherhood is just too demanding or limiting for us to connect to God. Creating this course was my way of taking a stand. No more guilt. No more shame. No more perfectionism or legalism. And most of all, no more LIES — lies about who God is and who he says WE are. Lies about God’s presence and whether there’s some “good Christian mom checklist” we have to check off in order to earn it. My hope and prayer is that you allow Moms in Pursuit to help you replace those lies with the life-giving TRUTH. You don’t have to pursue the Lord perfectly — because he is already perfectly pursuing you. It is possible to connect with God and stay rooted in the Word, even in this busy season. God doesn’t desire our performance or perfection; He desires our full hearts and a relationship. In the midst of the chaos and mundane, he is speaking to you and leading you by his Holy Spirit. You have been equipped with weapons to fight the enemy and walk in joy, peace, and freedom. You were never meant to navigate this season of motherhood alone. From one mama in the trenches to another, I’d love to navigate this season with you. ✔ EXPERIENCE AND ENCOUNTER THE LORD IN NEW WAYS? ✔ FIND A RHYTHM THAT ACTUALLY WORKS FOR YOU AND GROWS YOUR RELATIONSHIP WITH GOD? ✔ BEAT THE MOM GUILT THAT’S KEEPING YOU DOWN? ✔ TRADE YOUR ANXIETY AND PERFECTIONISM FOR CONFIDENCE AND FREEDOM? ✔ GET INSPIRED TO PURSUE THE LORD OUT OF LOVE INSTEAD OF FEAR? ✔ FEEL MORE JOY IN YOUR EVERYDAY MOTHERHOOD? ✔ EXCHANGE THE LIES OF THE ENEMY FOR THE TRUTH OF THE GOSPEL? One of the great parts about Moms in Pursuit is that it’s designed for you to go through at your own pace — so even the busy mama can rest easy! 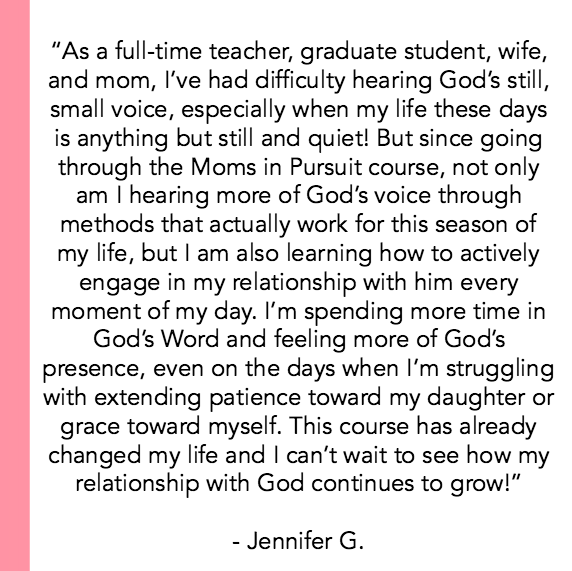 When you purchase Moms in Pursuit, you’re given instant, FOREVER access to beautiful, helpful, and easy-to-use tools that can help you start connecting even deeper with the Lord today. So, what do you say? Are you ready to dive in? WHAT OTHER MOMS ARE SAYING . . .
At checkout, you will create a log-in and password, which will be used to sign into the course. Immediately after your purchase is completed, an email will be sent to your Inbox with a link to the private Moms in Pursuit access page, which you will be able to access with your log-in information. This page will contain all of the course content, including 7 videos, the course workbook, and additional worksheets and templates. If you purchased the Mentorship Package, your bonus content will also be sent to you immediately via email. Can't dive in right away? No worries! Each video is pre-recorded and can be watched at any time! They don’t expire so you can go back and watch them as many times as you’d like. The workbook and all other worksheets are also available indefinitely and can be downloaded directly from the Moms in Pursuit access page. Absolutely! This entire course is designed for you to go through at your own pace. You can take as little or as much time as you need! Once you join, the content is yours forever! This course does not expire and neither do the videos, workbook, and worksheet included in it. You are free to go back through it as many times as you’d like for as long as you’d like. I designed this course specifically for moms with little ones, but if you are a mom who is out of the baby and toddler stage, I would still love to have you! The truths I aim to communicate through Moms in Pursuit are things that we ALL could use reminders of. If you are a mom with kids of ANY age who wants to grow her in relationship with the Lord, I believe Moms in Pursuit will be a helpful course for you. When you sign up for the mentorship package, you will have the opportunity to schedule a thirty minute one-on-one phone call with me that will take place within two months of your purchase date. During this call, I will personally walk you through how to apply the wisdom and tools you’re gaining from the course and help you cast vision and set goals. I also will chat with you about whatever is on YOUR heart and do my best to speak life-giving truth into different areas of your life, whether motherhood-related or not. My desire is to be a source of support and accountability for you! The mentorship package also includes one bonus video sent to your Inbox that walks you step-by-step through praying on the armor of God, as well as a downloadable prayer template. You will also receive in your Inbox three additional worksheets and templates for your personal and spiritual growth, including a monthly goal calendar and my Grace for the Hustle planner worksheet for busy moms. Due to the immediate, direct access to all course content, I do not offer refunds of any kind for the Moms in Pursuit course. I am, however, invested in making sure you have the best experience possible, so please don’t hesitate to email me with any questions you may have if you are unsure if this course is the right fit for you. I’m happy to answer your questions at any time! Feel free to send an email to jessie@soulcareforthenewmom.com or contact me through the form on my Contact page. Hey, I’m Jessie! I live with my husband Grant and our two girls, Tessa and James, in a little house just outside of Atlanta, Georgia, and I am passionate about seeing moms pursue the Lord wholeheartedly and walk in the freedom of the Gospel! I created Soul Care for the New Mom in September 2017 out of a desire to encourage other mamas in their faith and motherhood journey — because as we care for our little ones, our souls need care, too. You should know that I kinda sorta have a thing for podcasts, including my own, the Soul Care for the New Mom Podcast! I also LOVE hanging out on Instagram and building authentic relationships with other mamas who are in the trenches of motherhood and love Jesus just like me! Hope I get a chance to connect with you soon!